In celebration of Earth Day, we’re joining an event at Seattle Arts & Lectures that engages eco-poetics as a form of political resistance. The event also serves as the launch of the Copper Canyon Press anthology HERE: Poems for the Planet. The reading and discussion features poets who have written with urgency and hope about the natural world, and is supported by Cave Canem, CantoMundo, and Kundiman. Purchase tickets and read more about the event here. The Fordham English Department, the Office of the Chief Diversity Officer, and Kundiman are sponsoring Kindred: A Summit at Fordham's Rose Hill Campus. All POC identified students and faculty are invited to join us as we discuss visibility of POC communities at Fordham, meet with and hear from POC clubs and organizations, and connect with professionals who work within the arts. The discussion will feature Cave Canem's Ama Codjoe, Kundiman's Cathy Linh Che, CantoMundo's Deborah Paredez, and journalist Jose Antonio Vargas. The event is open to Fordham University students and faculty. Dinner will be provided. Our 2019 Mentorship Lab applications close today! For the next installment in our series of Creative Nonfiction Intensives, Kundiman is excited to present the Personal Essay Intensive with Larissa Pham! This two-day workshop will focus on writing from one’s life, as well conducting research to strengthen themes within a piece. The Personal Essay Intensive will be limited to 15 participants and will be held at The Ace Hotel New York’s Boardroom. You can register here. Thank you to The Ace Hotel New York for their support of this event! Literaoke is back at AWP 2019! Join us as we fuse literature and karaoke together for an unforgettable night. Six Kundiman fellows will present their new books/chapbooks and hold a reading! At AWP Portland, four Kundiman Fellows will be signing at our booth. Visit Booth 3055 to meet Neil Aitken, Shamala Gallagher, Vanessa Huang, and Lillian Li! See all of our AWP19 programs here. Neil Aitken is the author of two books of poetry, Babbage’s Dream (Sundress 2017) and The Lost Country of Sight (Anhinga 2008), winner of the the Philip Levine Prize, as well as a poetry chapbook, Leviathan (Hyacinth Girl Press 2016), an Elgin Prize winner. He is the founding editor of Boxcar Poetry Review, curator of Have Book Will Travel, and host of the podcast series, The Lit Fantastic. He also co-directs De-Canon: A Visibility Project & Library, which showcases the work of writers of color in a physical archive while also providing an online exploration of the intersection of race and literary production and canon-making. His poetry has appeared in The Adroit Journal, American Literary Review, The Collagist, Crab Orchard Review, Ninth Letter, Southern Poetry Review, and many other journals and anthologies. Shamala Gallagher is a poet and essayist who is working on a novel. Her recent work appears in Poetry, Poetry Northwest, Gulf Coast, Black Warrior Review, The Missouri Review, Verse Daily, Poetry Daily, Copper Nickel, West Branch, The Offing, and The Rumpus, among other journals, as well as in the anthologies Completely Mixed Up: Mixed Heritage Asian North American Writing and Art (2015) and Bettering American Poetry vol. 2 (2018). Her chapbook I Learned the Language of Barbs and Sparks No One Spoke was published by dancing girl press in 2015. She holds a BA from Stanford University and an MFA from the Michener Center for Writers at the University of Texas-Austin, and she has received fellowships from Kundiman, Virginia Center for the Creative Arts, Vermont Studio Center, and the New York State Summer Writers Institute. She has worked as a case manager for homeless families in San Francisco and for HIV+ individuals in Austin, TX. She has volunteered and worked in several domestic violence shelters, and she has taught writing workshops in public schools and community centers. She currently teaches creative and critical writing at the University of Georgia in Athens, where she's pursuing a PhD in English. Born in Berkeley and home in diaspora from California and Taipei to Atlanta, New York, and Tianjin, Vanessa Huang is a multimedia poet, artist, and cultural worker whose practice inherits teachings from the prison industrial complex abolition, gender liberation, and intersecting social justice movements. For over 15 years, Vanessa has worked to shift cultural narratives and strategies based in fear, violence, and exploitation towards realities centering love, vision, and transformation. Vanessa’s deejaying extends this practice, continuing to conjure public/digital space for sonic healing and freedom dreams. quiet of chorus (UpSet Press 2018) is Vanessa’s debut poetry collection. Vanessa has received literary fellowships from Kundiman and Macondo, holds a BA in Ethnic Studies from Brown University, and has worked with racial, economic, and trans/gender justice organizations with a focus on decarceration, homecoming, and transformative justice. Vanessa’s interdisciplinary work and writings have conversed through community organizing, printmaking, and rallies; film, choreography, and sonic performance; letters to/from prison and with bread delivery through a community supported bakery subscription newsletter; and a range of publications including critical race and gender studies journals, magazines, and the anthologies Abolition Now: Ten Years of Strategy Against the Prison Industrial Complex (AK Press, 2008), Captive Genders: Trans Embodiment and the Prison Industrial Complex (AK Press, 2011), Revolution Starts at Home: Confronting Intimate Violence Within Activist Communities (South End Press, 2011), and Writing the Walls Down: A Convergence of LGBTQ Voices (Trans-Genre Press, 2015). This fourth annual Asian American Caucus is a town hall-style hang out and community space. Come meet other Asian American writers and discuss fellowships, publication opportunities, and resources available to support you. Three prominent and essential writers take the stage to give readings of their work. A discussion follows on a variety of topics, ranging from craft to practice to activism, as we celebrate and further a discussion of Asian American and Latinx identity and solidarity. Monica Youn, author of Blackacre, Ignatz, and Barter and former lawyer, will read her poetry, which explores new territories of art, meaning, and feeling. Youn has been called “one of the two or three most brilliant poets working in America today”; her work has won numerous awards, including the William Carlos Williams Award of the Poetry Society of America. She will be joined by Seattle poet-activist and civil rights lawyer Shankar Narayan, whose work grapples with identity, belonging, and power. This reading is presented in partnership with 4Culture through the Claiming Space project, which aims to lift the voices of writers of color throughout King County. Monica Youn is the author of Blackacre (Graywolf Press 2016), which won the William Carlos Williams Award, was a finalist for the National Book Critic Circle Award and the PEN Open Book Award, and was longlisted for the National Book Award. Her previous poetry collections are Ignatz (Four Way Books 2010), which was a finalist for the National Book Award, and Barter (Graywolf Press 2003). She has been awarded the Wallace Stegner Fellowship at Stanford University and the Witter Bynner Fellowship of the Library of Congress, as well as residencies at Civitella Ranieri, the Rockefeller Foundation – Bellagio, Yaddo, and MacDowell. A former lawyer and the daughter of Korean immigrants, she currently teaches at Princeton University and in the Columbia University and Sarah Lawrence MFA programs. Shankar Narayan explores identity, power, mythology, and technology in a world where the body is flung across borders yet possesses unrivaled power to transcend them. Shankar is the winner of the 2017 Flyway Sweet Corn Poetry Prize and has been a fellow at Kundiman, Jack Straw, and Hugo House. He is a 4Culture grant recipient for Claiming Space, a project to lift the voices of writers of color, and his chapbook, Postcards From the New World, won the Paper Nautilus Debut Series chapbook prize. Shankar draws strength from his global upbringing and from his work as a civil rights attorney for the ACLU. In Seattle, he awakens to the wonders of Cascadia every day, but his heart yearns east to his other hometown, Delhi. Connect with him at shankarnarayan.net. This month, Kundiman has created a Poetry & Democracy Action Calendar for the Poetry Coalition's March programming. We've enlisted 4 curators to create folios of material for each week. This week, Dulani delves into the rich history of Asian American solidarity. See the whole week here! Read more about our Poetry Coalition project on our website. In collaboration with the Poetry Coalition, Kundiman and over 40 organizations nationwide are creating programming on the theme of Poetry & Democracy during the month of March. Each year, Kundiman also takes part in a Postcard Project, where a community of our fellows commits to writing a postcard a day throughout the month of March. Additionally, this year Kundiman created an Action Calendar that focuses on Immigration, Documentation, Asian American Activism, and Solidarity; each week will include an introduction, a folio of poems, a writing prompt, and direct actions. 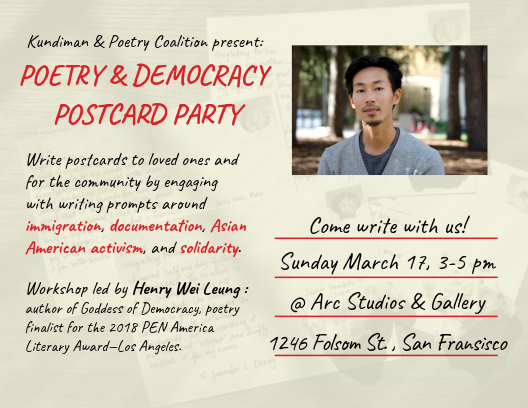 At this event on March 17th, we'll be writing postcards, thinking about action items and democracy, and engaging in writing prompts. Come prepared to write postcards to loved ones as well as in service to the community. Henry Wei Leung, author of Goddess of Democracy (Omnidawn 2017), will be present to frame our understanding of democracy through his work and lead the group through a writing prompt. Henry Wei Leung is the author of Goddess of Democracy (Omnidawn, 2017), a poetry finalist for the 2018 PEN America Literary Award—Los Angeles. He is also the translator of Wawa’s Pei Pei the Monkey King (Tinfish, 2016). He has been awarded Kundiman, Soros, and Fulbright Fellowships, among others. He recently dropped out of a Ph.D. program to pursue a J.D. at Berkeley Law, where he volunteers his time at the Workers’ Rights Disability Law Clinic. He will be working at the San Francisco City Attorney's Office this summer. This month, Kundiman has created a Poetry & Democracy Action Calendar for the Poetry Coalition's March programming. We've enlisted 4 curators to create folios of material for each week. Janine Joseph is our curator for the week of Documentation. See the whole week here! Read more about our Poetry Coalition project on our website. It’s the last day to apply for our 2019 Youth Leadership Intensive! This month, Kundiman has created a Poetry & Democracy Action Calendar for the Poetry Coalition's March programming. We've enlisted 4 curators to create folios of material for each week. This week, Ryan Lee Wong delves into the rich history of Asian American activism. See the whole week here! Read more about our Poetry Coalition project on our website. In a first-time collaboration, Asian Pacific Islander arts organizations APICC, Bindlestiff Studio and Kundiman invite the community to commemorate Women’s History Month with a celebratory showcase of API women artists. Resident Bindlestiff and Kundiman artists will perform monologues and literary works conveying intimate and profound expressions of womanhood, identity and lineage. Beginning on International Women’s Day on March 8, this celebration is in deep appreciation and solidarity with API Women, their unique experiences, and their cultural impact through performance and literature. This collaborative literary/performance showcase is in support of the exceptional featured artists and the long-standing organizations. There will be two iterations of this event: Join us on March 8 for International Women’s Day at 8 PM, or on March 9 for a special event reception with refreshments at 7 PM. Tickets are $15 presale and $20 at the door. RSVP and find more details on Facebook! Our 2019 Mentorship Lab runs from July 2019–December 2019. Applications are open through April 15th! We will be sharing a Poetry & Democracy action calendar for March, which will focus on one topic each week: immigration, documentation, Asian American activism, and solidarity. Join our friends at Poets Out Loud & Fordham University for a reading celebrating our 2016 Poetry Prize winner Sharon Wang, as well as Meg Day! The Desert Nights, Rising Stars Writers Conference is two days of literary craft and community at Arizona State University. Join author Alexandra Kleeman for an afternoon of generative writing, close reading, and discussing multiracial identity. Kundiman is celebrating Sarah Gambito's book launch of her third collection of poems Loves You (Persea Books). Wear your pang bahay (your comfiest, comfiest home clothes) and join us in celebrating Loves You, a poetry "cookbook" on food, memory, outrage, and family. Expect poems, bibingka, deconstructed banh mi, recipes, a reiki soundbath, chocolate matcha lava, breath meditation, and more. Directions: Once you are at Fordham, Take escalator to Plaza level Take elevator to 11th floor Take stairs one flight up to the 12th Floor. Applications for our second Youth Leadership Intensive are now live! Applications are due on January 15th, 2019 for the 2019 Kundiman Asian American Retreat! At Retreat, we aim to nurture the next generation of Asian American writers. Master classes taught by nationally renowned poets and fiction writers. The Retreat takes place at Fordham College at Rose Hill, located in the Bronx, NYC, and runs from June 19 – 23, 2019. Dance party + guerilla poetry reading. You and your friends are invited to celebrate Angela Penaredondo’s 40th birthday. To honor the departure of an intense 2018 and the beginning of 2019 with hope and healing. Join us for an outdoor guerilla reading (under the “Poetry in the Streets” sign). This reading is dedicated to queer futurisms, spell-casting for 2019. Then dance and mingle with us inside. (Support your local-dive-business. And for those who don’t dance, then Blipsy’s old-skool arcade games are for you). (Background on the title of this event) Back in the day, Filipino migrant workers (also known as Manongs) as a way to cut loose from their white oppressors, went to dancehalls (or taxi dances). In these dancehalls they swaggered, danced with white women during a time of anti-Filipino sentiment and anti-miscegenation mentality. As a queer Filipinx, I honor my ancestors, their histories but at the same time subvert, challenge a past that did not include me by incorporating my queer lens into the Now. 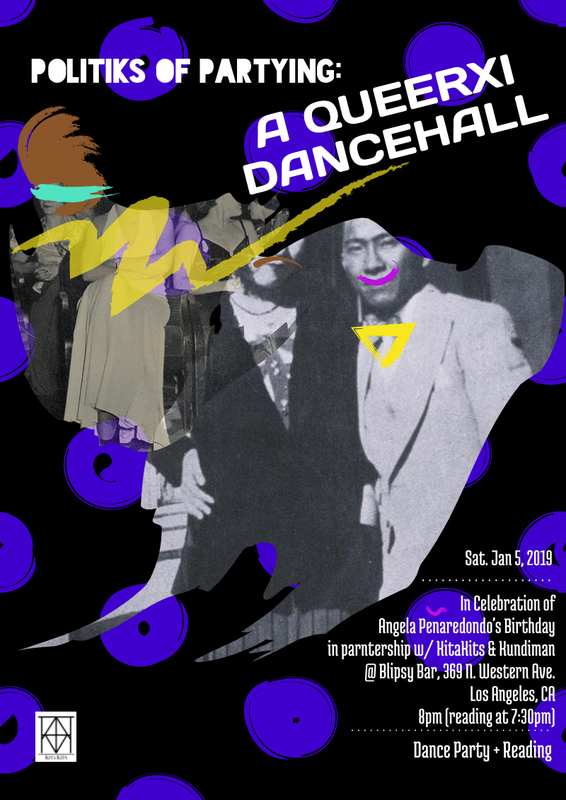 Come celebrate a night of this re-imagination along with published, award-winning queer identified writers; and sound pilots spinning fave throwbacks, vintage tunes, Manila disco, dancehall to space-glitchy beats. Let’s implicate our brown, black, queer, diasporic and undocumented bodies in a shared reimagination of the taxi dance—it’s a queerxi (said like "quir-ky") dancehall! Come in your own expression of retro dancehall wardrobe. Even a single accessory is fine (however, this is NOT mandatory). If you’re not feeling it, come as you are. Allow this space to be a refuge of free fun from an all-too-overrated-expensive-new year’s-eve. Allow it to be a brief refuge from all the social justice and resistance work you do. Let dance, swagger, joy also be a form of resistance too. After your dinner, stop by Queerxi for merienda-sweet-tasties provided by Lola’s Kusina (Filipinx/a pop-up kitchen) specializing in vegetarian Filipino food. This night aims to be an inclusive & hate-free space. Banish your phobias at the door and let them go forever. *KitaKits is an experiment. We initiate artist-centered efforts to assemble a strong alliance of PilipinX American Artists that live and work in LA. We want to create an art pamilya movement. We have art to share and our city is brimming with Pilipinx flair, genius and relevance. We flourish within our own myriad communities, but always seek support from each other with an aim to create work that reflects the issues of the day. In the end, we see art like breathing. *Kundiman is a national nonprofit organization dedicated to nurturing generations of writers and readers of Asian American literature. Kundiman is taking over Pete’s Reading Series for the night on December 20th! Applications are now open for the 2019 Kundiman Retreat! With master classes taught by nationally renowned poets and fiction writers, this retreat establishes a nurturing community for Asian American fellows. The Retreat takes place at Fordham College at Rose Hill, located in the Bronx, NYC. The 2019 retreat will run from June 19 – 23, 2019. The application period is open from December 1st, 2018 until January 15th, 2019. Scholarships are available. The Poetry Society of America and Poets House present a celebration of Marilyn Chin's A Portrait of the Self as Nation: New and Selected Poems (W. W. Norton, 2018). Marilyn Chin will give a reading on Wednesday, November 14, at Klapper Hall in the Godwin-Ternbach Museum at 6:30 PM. The event is free, and will be followed by a reception. Visit the CUNY English Department website for more details! Kundiman is excited to announce our second Food Writing Intensive, taught once again by New York Times critic Ligaya Mishan! We have expanded to a two-day workshop to be able to go even deeper into the world of food writing.